The Government is making a critical decision on whether to overturn the admissions cap which prevents Catholic schools from allowing all Catholic pupils to attend. They have acknowledged that this policy discriminates against Catholics and promised to abandon it, now we need you to tell them not to u-turn on their promises to Catholics. Search for ‘Catholic Education’ in your search engine to write to the Government [via an online petition] and urge them to drop their policy which bans new Catholic schools. This will be held at 2.30 pm on Tuesday 5th December at Christ the King Church followed by refreshments afterwards in Harraby Catholic Club. If you need assistance with transport, please contact Paul Daley. The Ladies Group are having an Advent Night out on Thursday 7th December. They will be meeting at David’s Restaurant on Warwick Road at 7.00 pm sharp. They will have their monthly meeting on Thursday 14th December - the subject will be Christmas Flowers. Many thanks to all who supported this evening - and thanks also not only to those behind the scenes who organised it, but also to the House of Malt on Crosby Street for leading the tasting. The Festival Choir will be meeting on Sunday evenings at Christ The King Church from 7.00 pm to 9.00 pm. 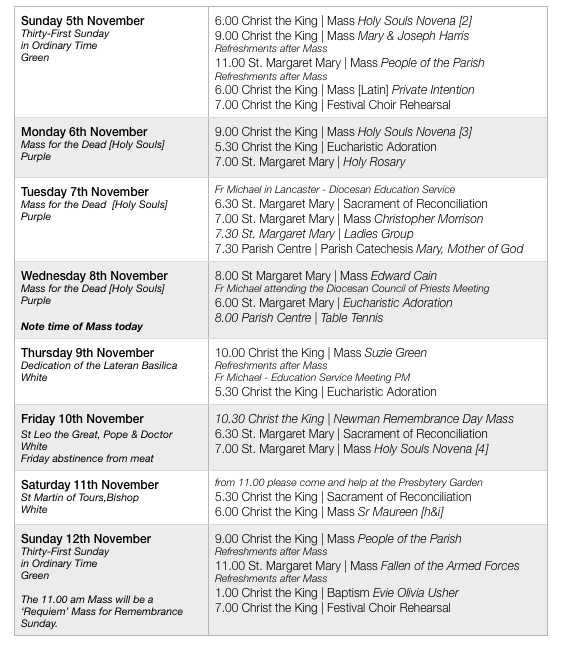 Please consider coming along to help us to prepare for the Holy Season. Everyone is welcome. During Advent, we again are united in turning towards the Lord together as priest and people as we await his coming at Christmas. All Masses during Advent will be celebrated ad orientem [facing East] as was the custom last year. Thank you so much for your warm welcome back. I was very sorry to be leaving you all so soon again. Thank you very much for all your love and support and allowing me to be part of your joys and sorrows. Thank you for your prayers and support during my illness, which was very much appreciated. Your tremendous generosity was typical of you. I now have an iPhone, which is great, and its many features are making it easier for me to communicate. There is still some over for me to send to those I help in Zambia. Wishing you all a very Happy feast of Christ the King. I will be with you in spirit. Promising you and your families the support of my prayers. Sr. Maureen. The Parish Carol Service will take place on Sunday 17th December beginning at 7.00 pm in Christ The King Church. Please make every effort to support this Parish event. It will be followed by festive refreshments in the Presbytery. Numbers at Mass were Saturday evening - 50, Sunday 9.00 am - 49 and Sunday 11.00 am - 97 A total of 196. Thank you for the offering of £346.07 at Christ the King and £268.68 at St. Margaret Mary. The total being £614.75. The Rorate Caeli Mass is a traditional Advent devotion wherein the Mass of the Blessed Virgin Mary for Advent is offered just before dawn and is lit by candlelight alone. The interplay of light and darkness speak to the meaning of Advent and the coming of the Light of the world. 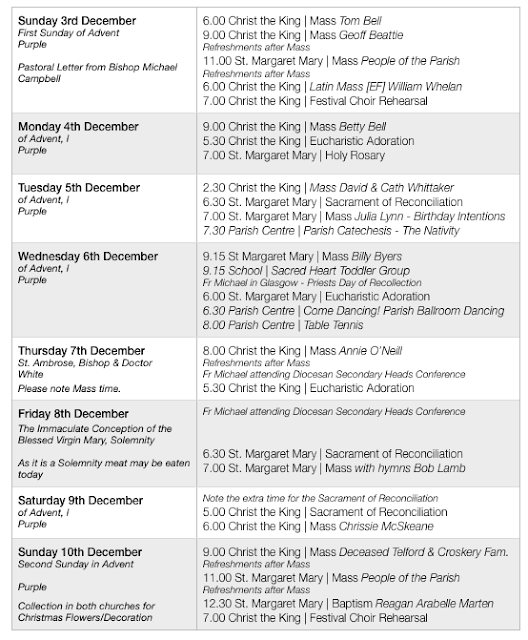 There will be a Rorate Caeli Mass celebrated at Christ the King on Saturday 16th December at 7.30 am. Why not make this a special moment in your preparation for Christmas. Please make an extra effort to go to confession during Advent. The Sacrament of Reconciliation is available at St. Margaret Mary on Tuesday and Friday evening from 6.30 pm and on Sunday morning from 10.30 am. At Christ the King on Saturday evening from 5.00 pm. Please note that this is a particular issue in the south of England where much needed new Catholic schools are being prevented from opening…it is not related to the new build of Newman School which is a replacement build. Any girls who have made their First Holy Communion are invited to become members of a new altar guild in the parish - the Handmaids of the Immaculate Heart. A commitment to pray the Rosary once a week, to participate in formation about the care of the church, sacristy and altar and to help with the setting up of the church for Mass on Sunday. Next Sunday will be enrolment in the Guild. For more information, please have a chat with Fr Michael. Numbers at Mass were Saturday evening - 54, Sunday 9.00 am - 60 and Sunday 11.00 am - 95. A total of 209. Thank you for the offering of £381.90 at Christ the King and £278.40 at St. Margaret Mary. The total being £660.30. 7.00 pm to 9.00 pm. 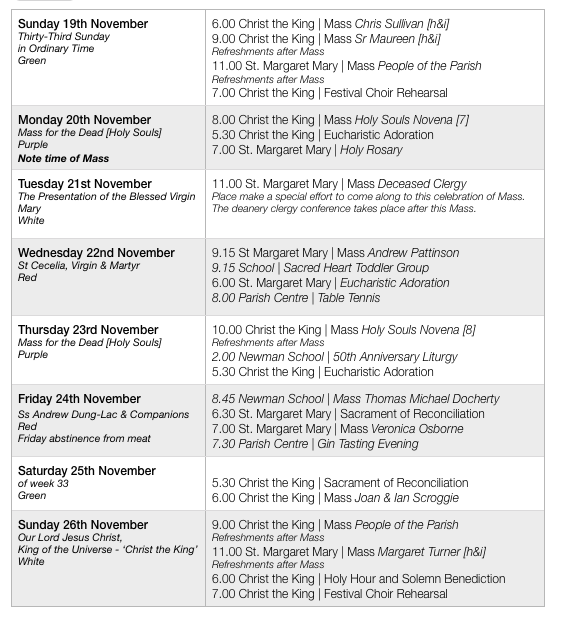 Please consider coming along to help us prepare for the Holy Season. Everyone is welcome. During Advent, we again are united in turning towards the Lord, together as priest and people, as we await his coming at Christmas. All Masses during Advent will be celebrated ad orientem [facing East] as was the custom last year. During Mass on Boxing Day [Feast of St. Stephen] [St. Margaret Mary 10.00 am], altar servers will be enrolled into the Guild of St. Stephen. Any boys wishing to become altar servers should approach Fr Michael. In one of the richest countries in the world, no one should be hungry at any time of year. But there is something almost obscene about parents worrying about how to feed their children at Christmas or people being alone with no food whilst the rest of the country over-indulges, eating a week’s worth of calories in a couple of days. If you would like to help your local food bank and SVP, join in collecting a Reverse Advent Calendar this year. It’s a great way to show your children that Christmas is a time for giving, not just getting. It’s simple - instead of opening the window on an Advent Calendar - in a bag or a box place one item of food each day during Advent [see food bank notice above for ideas]. You can bring the items you’ve collected and place them in the Food Bank Basket [CTK] or SVP Box each week [MM] or on Christmas Eve where items can be placed around the Crib as a gift to the Infant Lord. Any girls who have made their First Holy Communion are invited to become members of a new altar guild in the parish - the Handmaids of the Immaculate Heart: A commitment to pray the Rosary once a week; to participate in formation about the care of the church, sacristy and altar and to help with the setting up of the church for Mass on Sunday. For more information, please have a chat with Fr Michael. Thank you to all who came along to get the Presbytery Garden ready for winter…your help was greatly appreciated. 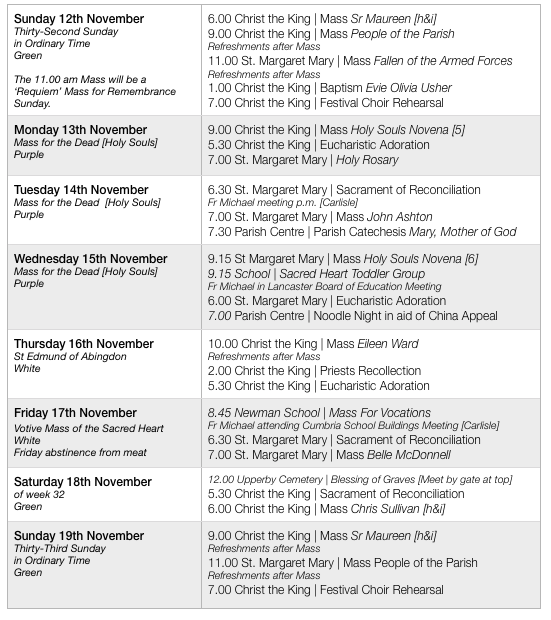 Numbers at Mass were Saturday evening - 65, Sunday 9.00 am - 72 and Sunday 11.00 am - 106. A total of 243. Thank you for the offering of £351.95 at Christ the King and £302.80 at St. Margaret Mary. The total being £654.75. 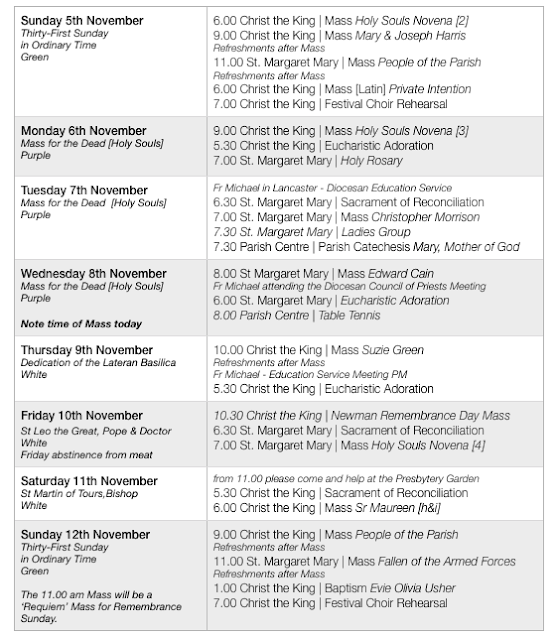 8-10 December - Take time out from the busy run-up to Christmas to prepare for the Lord’s coming. This weekend retreat, for young people in year 9 and above, will be a fun occasion to meet other young people and, together, reflect on what Christmas is really about through games, workshops, discussions and prayer. Cost - £65. www.castleriggmanor.co.uk. The Extended Family of the Sacred Heart Sisters are hosting a Noodle Night on Wednesday the 15th November at 7.00 pm in St. Margaret Mary's Parish Centre on Scalegate Road. The event is in aid of our China Appeal. Tickets £5.00 - available from Alison Hather and Liz Sproat. A Gin tasting evening will take place on Friday 24th November in the Parish Centre at 7.30 pm. Tickets are £10 which includes a Gin and Tonic and a tasting talk with around 4 other Gins. Tickets available from the Parish Centre or John and Alison Hather. If you have your own business or if you work for a company, why not consider advertising in the Catholic Voice? It works for people, companies, events and organisations throughout the Diocese and it supports our Diocesan paper. Please contact Caroline on 07931 836926 or email carolineg@cathcom.org for more information. Encounter the Living God through Sacred Scripture. During this weekend we will be exploring the powerful and life giving message of St Paul in the Scriptures. To be held - Sat 18th - Sun 19th November 2017 at Cor et Lumen Christi, Wigton, CA7 9HU - DONATION ONLY EVENT. To book or for more information: Web: www.coretlumenchristi.org Email: stcuthberts@coretlumenchristi.org Tel: 016973 45623 or 07516 075896. First Holy Communion will be celebrated in the parish on Sunday 10th June 2018. Parents who wish their children to receive our Lord in the Eucharist for the first time should inform Fr Michael via email or in person before Christmas. 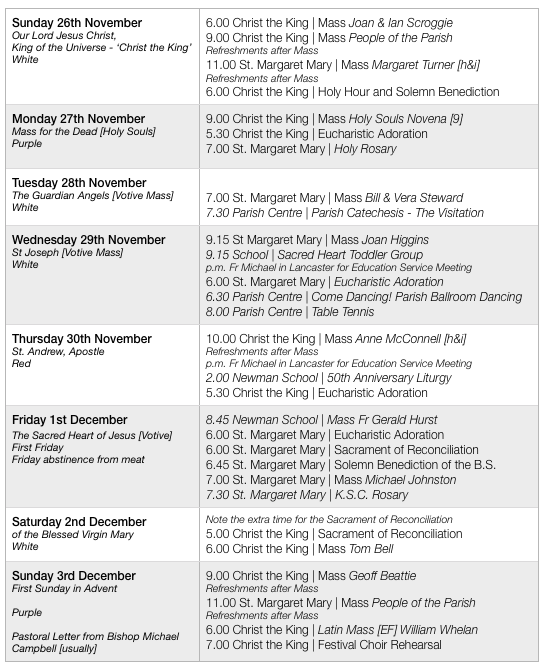 Families should be attending Mass in the parish every weekend. Catechesis [usually held on a Thursday evening] will begin in February.